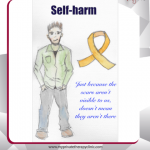 Self-Injury Awareness Day (SIAD) is on the 1st of March. […] People are often puzzled as to how is it possible for this behaviour to take place, and I am often asked about this condition in casual conversations – why would anyone want to harm his/herself? As strange as it might seem for many, this behaviour can serve a function and so there are comprehensible reasons as to why it occurs. […] To help explain how self-harm behaviour can arise, I’ll relate an example from my clinical work. 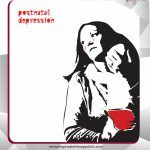 One in every 10 women experience postnatal depression within a year after they give birth. This type of depression develops gradually and consists of the usual symptoms, such as feeling low, being tired, lack of enjoyment, difficulties with sleep and concentration, and avoiding others. 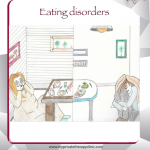 February 27th is the first day of Eating Disorders Awareness week, which aims to make people aware of the impact that eating disorders can have on a person and what we can all do to support someone who is affected. […] Here, I briefly present an example of a client I worked with (JT) to help him overcome his binge eating disorder.